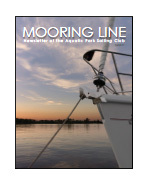 Aquatic Park Sailing Club is a 100 boat self-help club with the best sailing access to Lake Ontario in the GTA. We have a Club House, washrooms, and a large two-tier deck. We have barbecues and a small kitchen for members. Best of all we have an awesome sandy beach to relax in the shade after a day of sailing. Oh, yes, we also like roasting marshmallows on the bonfire, annual pig-roasts and dancing in the sand to live bands. If you’re looking to become a member of APSC, click on Join Us and the Frequently Asked Questions to learn what we have (and don’t have!) to offer. If you like what you see, click on the Application Form! You will find the Aquatic Park Sailing Club about halfway down the Leslie Spit, which defines the eastern perimeter of the Port of Toronto. Approximately one hundred boats, from large schooners to the graceful Yngling lie at moorings in this sheltered cove. Bird sanctuaries occupy much of the surrounding shorelines and it is not uncommon to see great blue herons sliding down for landings, to say nothing of the swans who paddle around, ever on guard. During the summer months, it is hard to believe that you are only minutes away from Toronto’s downtown core.